Bieler, A., Haluza-Delay, R., Dale, A. & McKenzie, M. (2018). 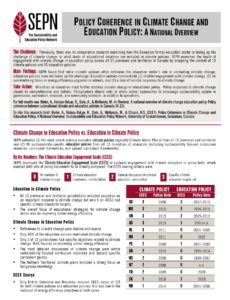 A National Overview of Climate Change Education Policy: Policy Coherence between Subnational Climate and Education Policies in Canada (K-12). Journal of Education for Sustainable Development, 11(2), 63 – 85. Click here to access?the paper. This article analyses the depth of engagement with climate change education policy across all 13 provinces and territories in Canada. A comparative content analysis of 13 climate action plans (CAP) and 90 K-12 education policy documents shows a major gap existing between Canada’s climate and education policies. While subnational climate policy calls for education to contribute substantially to addressing climate change, education policy is not aligned towards this call. Three themes emerged within the overview of the provinces and territories: shallow engagement with climate change within education policies; the predominance of energy efficiency upgrades for schools as a foremost education sector objective; and policy gaps that show a lack of attention to many areas of climate education. Further detailing the climate change education objectives in four provinces identified as playing a leadership role in climate policy, this research suggests that even among these climate leaders, K-12 education policy minimally attends to climate change. Alignment between Canadian and international trends in climate change education is also assessed.